Rivals of Ixalan is the follow-up to regular Ixalan, which we've had in our hands for a few months now. After the dust fully settled on the initial clamor for information about the format, we came to some conclusions. Ixalan being a tribal set—that is, a set where various tribes like Pirates and Dinosaurs are put at the center of the design path—we assumed that the tribes themselves would be a good place to start. 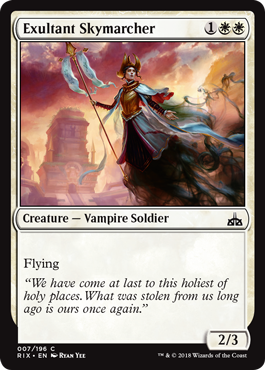 I found Vampires to be the most solid and consistent winner in Ixalan, along with red-white aggro and green-blue Merfolk. These weren't the only decks you could win with, but they topped my power rankings. As we transition into a new Limited environment with Rivals of Ixalan, what should we expect? For starters (and for the last time in the foreseeable future, as it turns out), I'll remind you that we'll be playing Booster Draft with two packs of Rivals of Ixalan and one pack of Ixalan. Sealed Deck will be four packs of Rivals of Ixalan and two Ixalan. The model for this is changing with the following set, Dominaria, but we'll cover that when it gets here. With Amonkhet, we had a format that was completely flipped on its head after Hour of Devastation came out. Normally, the small second set tends to accommodate and accentuate the original set rather than redefine everything about the environment. From what I can tell, that's exactly what we have in Rivals of Ixalan. The tribal themes carry over strongly from Ixalan, with a bunch of sweet new toys to play with. One thing that stood out from Ixalan was the relative speed of the format. The big three Auras—Swashbuckling, Mark of the Vampire, and especially One With the Wind—helped turn an already quick format into a crushingly quick one. We'll touch on the new tribal goodies in a bit. You get this by controlling ten permanents when you cast or control a card with ascend. Once you get the city's blessing, you'll have it for the rest of the game, and nobody can take it from you. 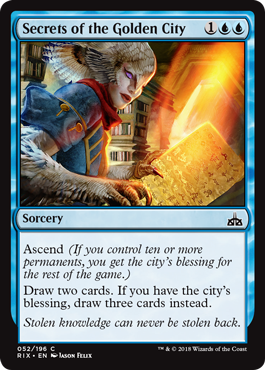 The cool part about these cards is that you can play them without the ascend ability turned on—they just aren't quite as good as they would be if you had the city's blessing. Then, later, if you get the city's blessing, they will improve. Secrets of the Golden City is obviously my favorite of these, as the thought of stalling the board long enough to get to ten permanents and then capping it off by drawing three cards (instead of a measly two) brings a smile to my face. There are two main things to consider when evaluating cards with ascend. First and foremost, how good is the card if you don't have the city's blessing? This is a big one, because if you can live with playing the card without the bonus, it's probably a solid card. When you play a good card, but have the chance for a great card for free later in the game, that's business. 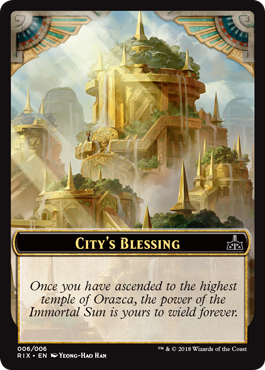 The second thing to look out for is how the card scales with the later game as you get more likely to get the city's blessing. Dusk Charger, for example, is a pedestrian 3/3 for four mana if you cast it in the early or middle part of the game. That's not great. Later in the game it can become a 5/5 if you get the city's blessing. Not bad, but you also have to figure the board will be pretty built out by then, so its utility is somewhat capped. Overall, I would say that Dusk Charger keeps up with the board rather than crushes it. 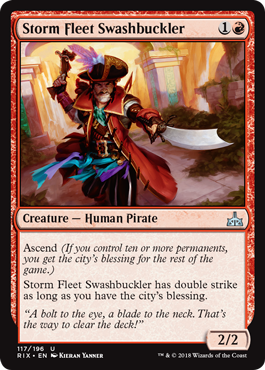 Storm Fleet Swashbuckler is similar. It's a perfectly serviceable 2/2 Pirate for two mana early in the game. But if the game goes long and you get the city's blessing, it becomes a 2/2 with double strike. Again, this is fine scaling with the game, but doesn't really overcome it at any point; it's likely that your opponent will have good blocks for a 2/2 with double strike if the game has gone long enough for you to get to ten permanents on board. I would look to augment the power of my Swashbuckler using Equipment or pump spells to really make it a relevant late-game threat. Orazca Relic, though—this guy gets it. This is what scaling with the game looks like. You play the Relic on turn three, and it helps you empty your hand and accelerate out some big threats. In doing so, you get the city's blessing. 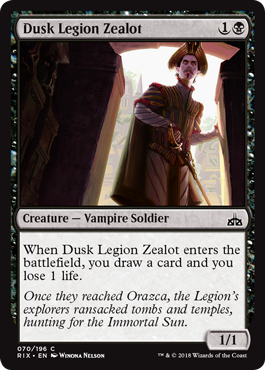 At this point, you've got a ton of mana sources anyway, and Orazca Relic has worn out its welcome. 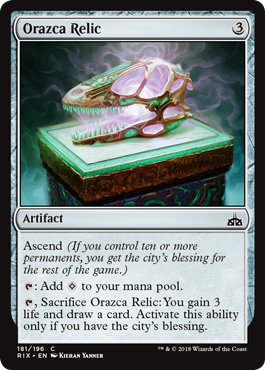 But fear not, once you have the city's blessing, you can cash in the Relic for two important things in the late game: life gain and a card! This is what you're looking for in an ascend card: a card that gives you what you want, when you want it. Things look much as they were in Ixalan as far as the tribes go. Vampires are still black and white. Dinosaurs are still green, red, and white. Merfolk are blue and green, and Pirates are blue, black, and red. 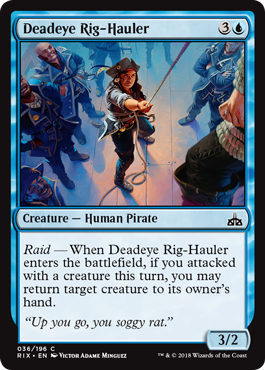 Let's look at a few commons from each tribe to see if we can get a feel for how they play out in Rivals of Ixalan. Exultant Skymarcher looks very solid for a three-drop, and good at getting damage in. 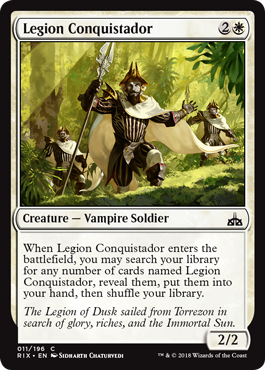 Legion Conquistador is a cool addition to Rivals because it makes it so any Legion Conquistadors in the lone Ixalan pack aren't hung out to dry. 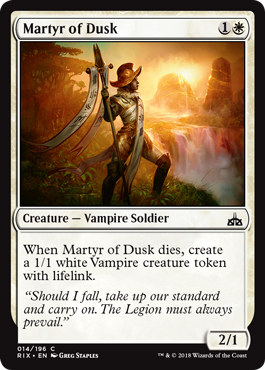 Martyr of Dusk looks really annoying for opponents to trade with, especially if you have any Equipment or other ways to boost your creatures up. Same thing goes for Dusk Legion Zealot, a Vampire body that effectively replaces itself. 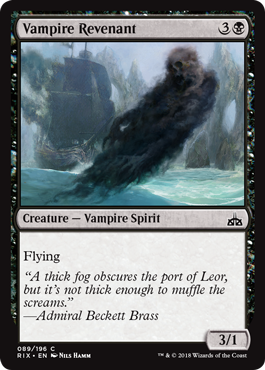 Vampire Revenant isn't super exciting, but 3 power is a lot for a four-mana flier. Vampires look similar to how they were before. They aren't super aggressive, but they are looking to attack. They can play the midrange game very well and are able to change strategies better than any deck in the format. Merfolk were sneakily the most aggressive deck in Ixalan. They had that whole "get ahead, stay ahead" thing down to a science. And from the look of things, they haven't slowed down much. 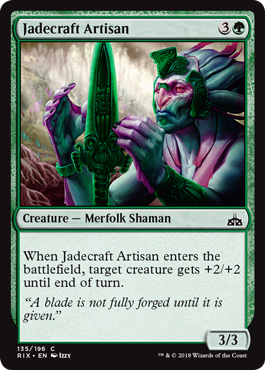 Jadecraft Artisan is yet another tempo bump for the Merfolk deck, unlocking attacks that it may not have had prior to this guy joining the team. 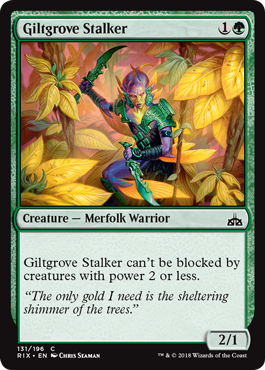 Giltgrove Stalker is a pesky two-drop that can't be traded with by smaller creatures. It's also a fine target at which +1/+1 counters and combat tricks can be aimed. Jade Bearer is kind of weird, in that it's only one mana, but you don't really want to cast it on turn one very often. Still, you are getting your mana's worth in the right build. 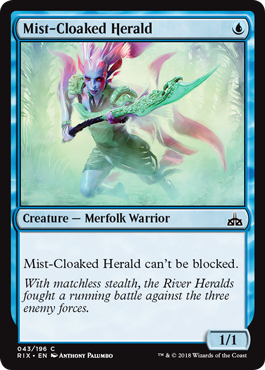 Mist-Cloaked Herald looks exactly like the type of card I'd tell you not to play, but I have a feeling it's going to be good in this Merfolk deck. It just holds +1/+1 counters so well, and getting a relevant play that early in the game when your whole game plan is to kill your opponent quickly is a big step in the right direction. Merfolk look like they are bringing the same heat they brought before, with perhaps even more speed. The question is if they can still do it with far fewer copies of River Heralds' Boon floating around. Oh, and I couldn't resist showing you this one. My goodness. This is an uncommon, and a darn good one at that. Plus it's gold, and Merfolk-specific, so if you are the lone Merfolk drafter at the table, you'll likely get any and all of these that were opened. This is good for you. Very good. Do this. 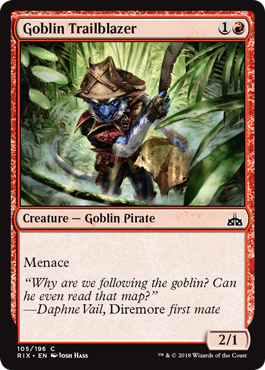 Pirates were the hardest to pin down in Ixalan. They could be aggressive (usually if you were black-red), more controlling (blue-black), or kind of in the middle (blue-red). We'll have to sort all of that out when we actually start cracking packs of Rivals, but let's see what we can garner from some Pirate commons. Judging from these Pirates, they still look pretty aggressive. Deadeye Rig-Hauler had me at haul-o. This is a fantastic design for this type of effect, as it rewards you for doing what you should be doing: attacking! 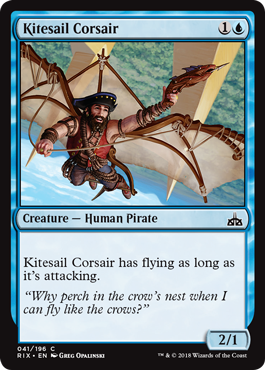 Kitesail Corsair does the same. This is a very powerful little two-drop; 2-power fliers at that cost aren't something you see every day. 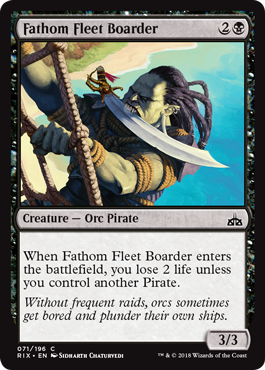 Fathom Fleet Boarder is super powerful, especially in an aggressive deck where the 2 life might not matter anyway. Generally, 3/3s for three are underrated. 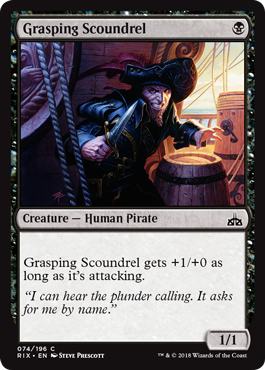 Grasping Scoundrel and Goblin Trailblazer are both cheap and aggressive. The Trailblazer specifically has a chance to be the best red common if the set is aggressive enough. Remember what I said about 3/3s for three mana? 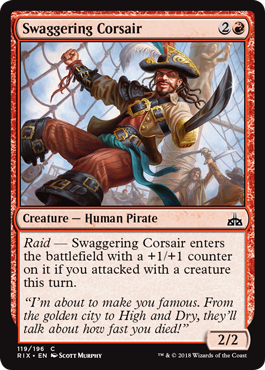 Meet Swaggering Corsair. Man, these Pirates seem aggressive too! A whole lot of rewarding attacks, preventing blocks, and getting on the board fast. We may need our seatbelts for this set. Everyone's favorite. Okay, well, my favorite. The various iterations of dinos ended up being on the weaker end of the spectrum as far as the tribal decks went in Ixalan. Let's see if they can make a bit of a comeback in this new set. 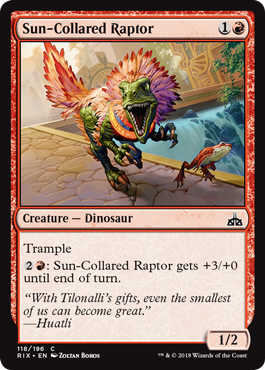 We start small, with a Sun-Collared Raptor. It doesn't stay small for long, though. Basically you have a threat-of-activation-type card here. Your opponent will have her 2/2 blocker, and will have to decide whether to block this on turn three, forcing you to use your mana but also taking a couple of damage and losing her creature. 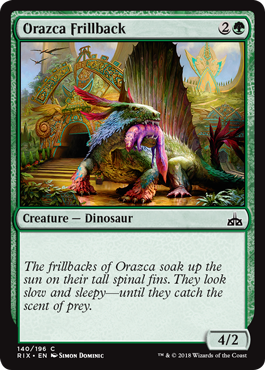 Orazca Frillback will remind you of its red cousin from Ixalan, and should play similarly. Knight of the Stampede is an interesting one because it's one of the few cards we've seen that is almost purely defensive. It lets you block for a bit while powering out your top-end Dinosaurs. 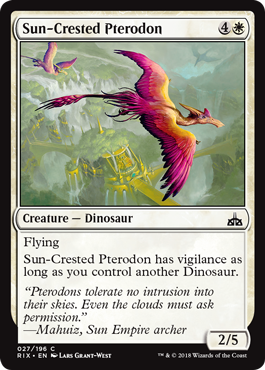 Sun-Crested Pterodon is another hint at a more controlling Dinosaur build. 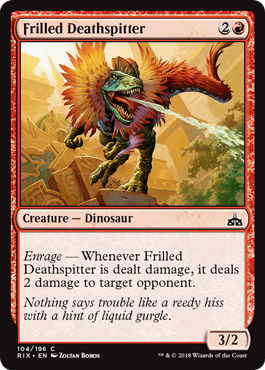 It basically blocks everything, and can even chip in for some damage with vigilance if you have another Dinosaur. The question is, is blocking something we're interested in? Frilled Deathspitter, huh? Cute. This one wants to attack and force blocks while still getting incidental enrage damage in. It adds up. 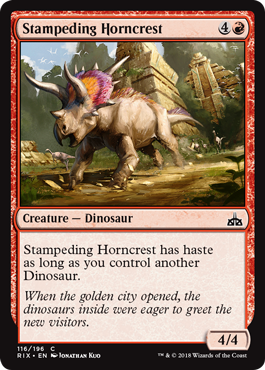 Stampeding Horncrest, as a 4/4 with haste at five mana, is a nice curve-topper and another data point toward attacking being the name of the game. If it doesn't have haste, it's just okay. Dinosaurs, like previously, seem to be a bit confused about whether they want to be attacking or blocking to set up huge late-game threats. It feels like you'll want to choose one or the other, as mixing the two strategies can have perilous results. After looking at a bunch of the commons in the set, it seems like the Limited environment is just as fast as before. But there are a few things to keep in mind. Looking back once again to how Hour of Devastation changed the landscape for Amonkhet Limited, one of the big changes was that the cycle of common Auras called Cartouches weren't in Hour of Devastation. 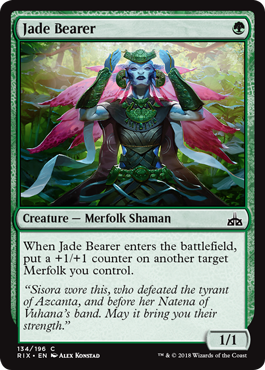 Well, the Auras I mentioned earlier from Ixalan have helped shape the relatively fast format it ended up being, and they are also being greatly reduced within the format. The removal in the set, as well as the tools to beat or recover from a quick start by an aggressive deck, will also play into it. But, of course, all those things and more are part of the super interesting journey we take every few months when a new set of Magic cards come out. And that's also why we keep coming back. 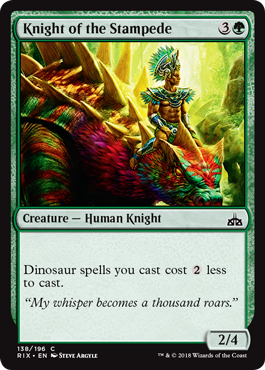 Good luck in your journey with Rivals of Ixalan when Prereleases begin January 13–14. Let me know how it goes!